After our false start at buying an RV from a dealer, we went back to private parties. 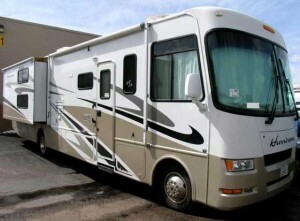 We originally we’re going to do the ‘5th wheel’ thing, but for convenience and less stress, we opted for a Class-A. 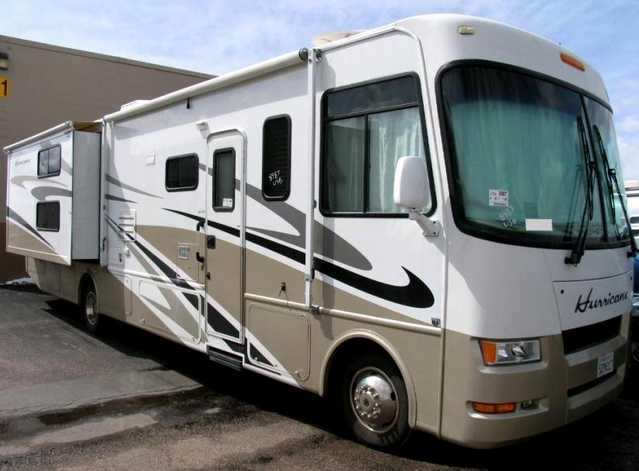 We ended up ‘buying’ a Class A from a dealer, but that didn’t go so well, so with a Class A in mind, we went back to looking at RV trader, RVT, and craigslist for mostly private party rigs – not a lot out there. We looked at some and thought of the options we wanted (some even that the new rig we ‘bought’ didn’t have) – drawers/storage under the dinette, drawers under bunks, king bed in master, extra space for the small dog crates. We really liked the Winnebago Sightseer 35J which had all those things, plus the workhorse chassis and a decent sized shower. We found a local one and brought an inspector who looked at things and found it was in great shape – except for a small hydraulic leak and an awning that had never been opened – and we couldn’t unfurl. It also needed shocks and bushings, but it also needed 6 new tires. The seller had it priced at top of market and even when we pointed out that it was in need of nearly $4,000 in repairs, he didn’t care. It also had that dank smell from the AC units that made it smell like a run down motel room in the bad part of town (yes, I’ve unfortunately been to too many of those). So we looked at one that was $10k less, and owned by a rental company. It took 10 days for it to be back in town so we could look at it. Ugh! – it was in bad shape – beaten up, floor had linoleum destroyed from the slide, trim was falling off everywhere. We didn’t even test drive that one. After taking quick peeks at a couple more, we found a 2007 Hurricane 34B with bunks about an hour away that had great looking pictures and was about the same price. It had a few things wrong, but over all it seemed like it was in great shape. Best of all, it didn’t have to go straight to the shop for $4k more work. So we prayed about it and weighed our options, and several days later, decided to buy it. It was sold by a small, indie, one-man dealer who seems pretty knowledgable. Overall, it’s a pretty decent rig we are happy with. It has more windows in the master that make it really nice. It doesn’t have the drawers under the bunks, or the king, or the workhorse chassis, but it works and it has brand new tires!